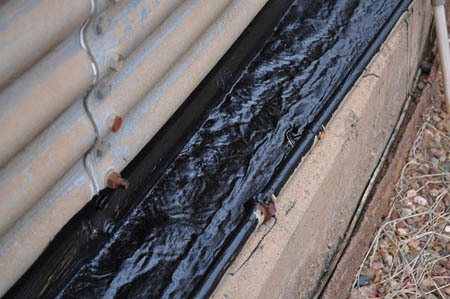 CONCRETE STRUCTURES NEED MOISTURE / WATER TO HOLD TOGETHER STRUCTURALLY. 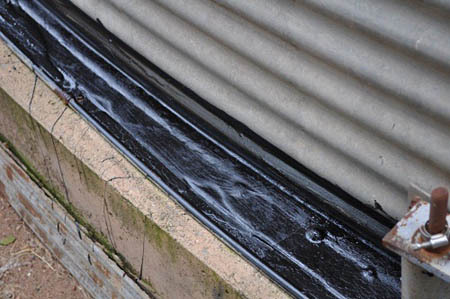 IF ALLOWED TO DRY OUT THE CONCRETE WILL THEN BECOME POURESS AND DRY STARTING TO THEN BREAKDOWN THE CONCRETE ITSELF. 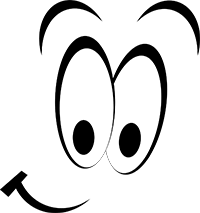 CONSIDER OUR PRESSURE INJECTION REPAIR SYSTEM BEFORE LINING THE INSIDE OF YOUR TANK ! 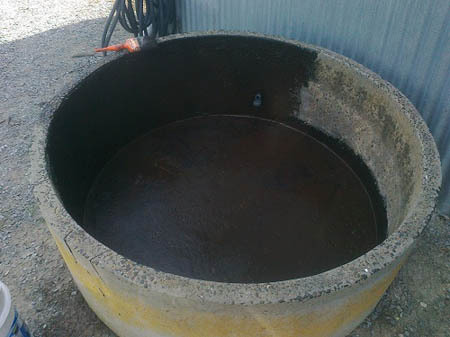 REFER TO THE STOP CONCRETE WATER TANK LEAKS PAGE FOR MORE INFORMATION. 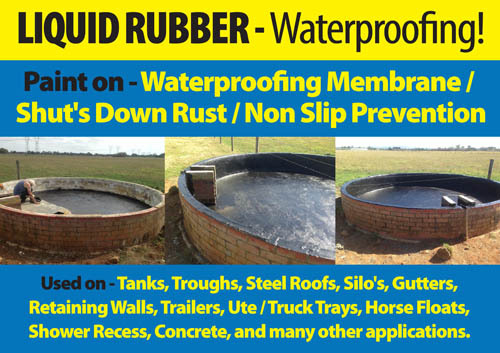 LIQUID RUBBER - WATERPROOFING, RUST PREVENTION, SOUND PROOFING! Paint on Membrane, Brush or Roller. 4 litres = 6 to 8 m2 area of application depending on how porous the surface is. 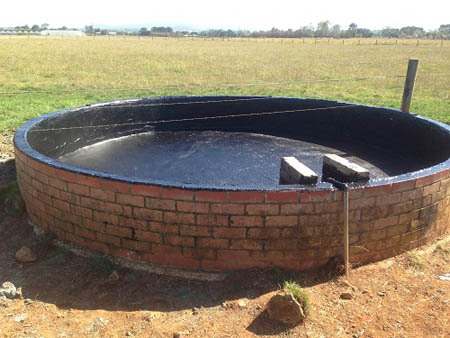 1930's Brick Cattle Trough - 4.9 meters diameter x 0.6 meter high - Liquid Rubber Paint on Waterproofing Membrane. Liquid Rubber - DIY paint on! NOTE :- TANK MUST BE TOTALLY CLEAN ( WIRE BRUSH CLEAN, REMOVE ALL DUST ) AND DRY BEFORE PAINTING ON LIQUID RUBBER ! 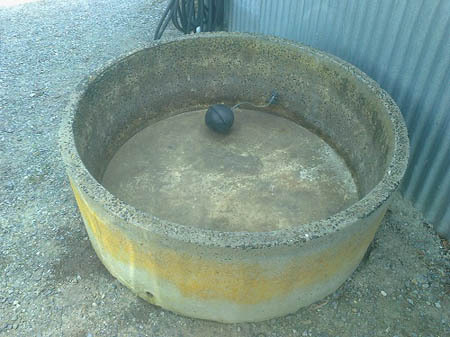 Refer to the bottom photo's for water trough step by step application and rust prevention on a grain silo. 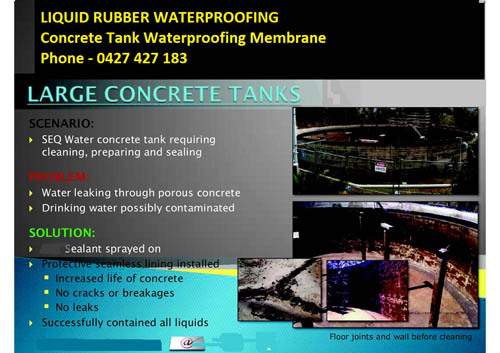 Class 3 - waterproofing membrane - for Bathrooms, Shower recesses, etc. Elastic application. 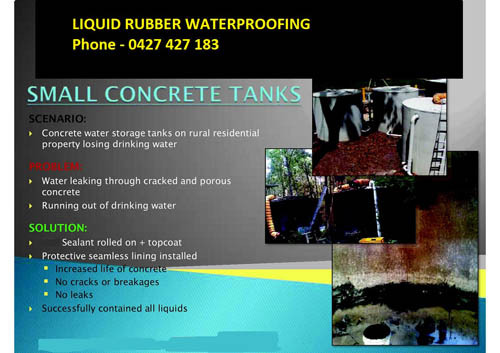 WATERPROOFING WATER TANKS, STORMWATER / PUMP PITS, SUMP PITS, TROUGH'S. SHOWER MEMBRANE WATERPROOFING, SHOWER RECESS, CLASS 3 MEMBRANE. SEALING WET AREAS, FLOOR'S, BATHROOMS. PREVENTING FURTHER RUST AND CORROSION. 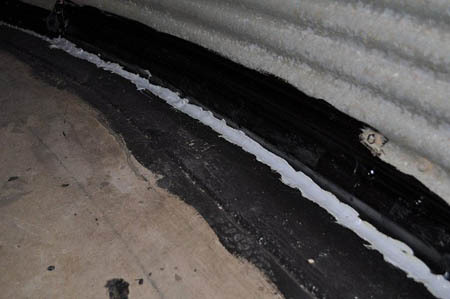 SEALING AROUND ROOF PENETRATIONS, UV RESISTANT. UTE TUB'S, TRUCK TRAYS, TRAILERS, MACHINERY. 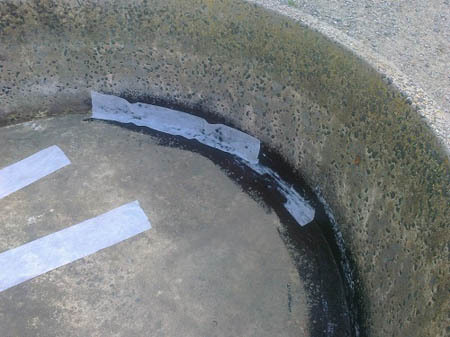 WATER TANK - LINER REPAIRS - ADHERES TO POLYETHYLENE LINERS. ANYTHING STEEL THAT WILL RUST AND NEEDS PROTECTION. LANDSCAPING, PONDS, WATER FEATURES, DRIVEWAYS, PATHWAYS. 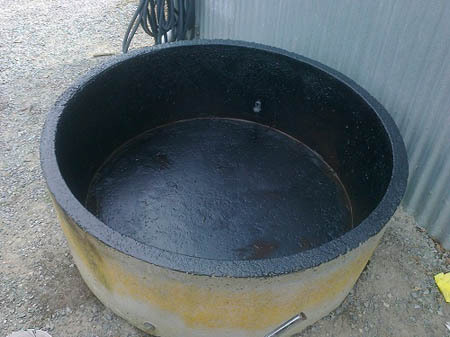 15 litre bucket @ 0.5mm thick coating = 20 m2 area of coverage. 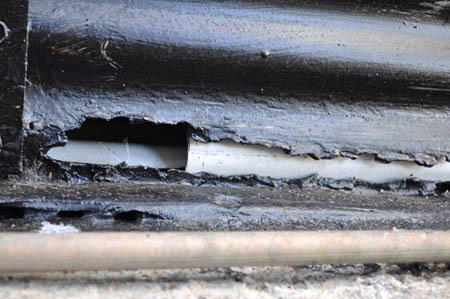 used to seal small cracks in masonry, water troughs and to seal leaks in roofs. 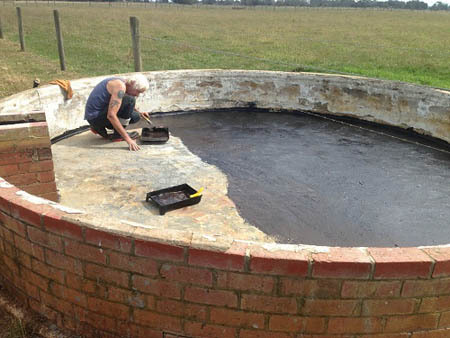 High Build is a versatile sealant on the farm. Protect plants and trees from disease by applying High Build to the exposed areas. If you are building a marine theme park or a garden pond behind the house, High Build seals and waterproofs around the most complex geometries. 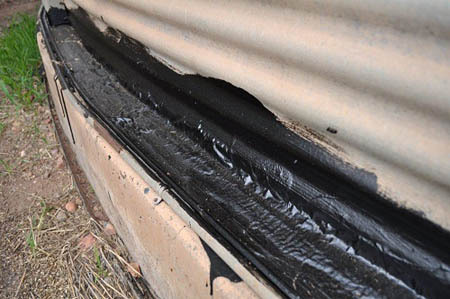 High Build has excellent adhesion to polyethylene liners, rock and concrete. 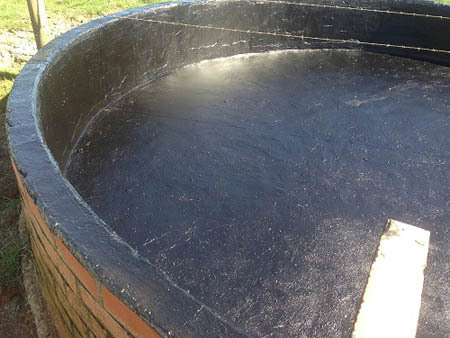 This makes High Build an excellent choice for waterproofing ponds, decorative pools, fountains etc. Easy to use, High Build can be applied using, a brush, roller or squeegee. 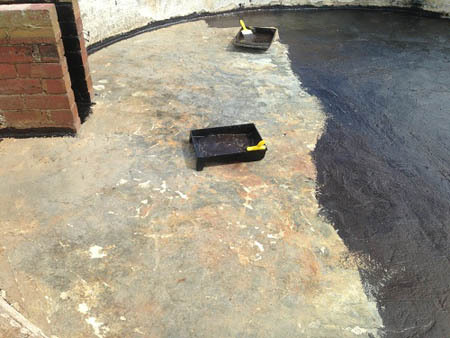 Liquid Rubber products can be applied by roller, spray, brush or trowel and are used for a wide range of waterproofing and corrosion protection appliances. 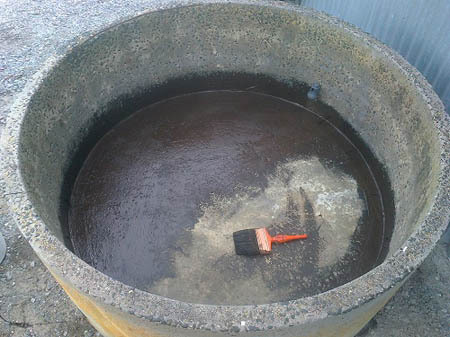 Liquid Rubber can be applied over existing membranes, rusty roofs, steel/colourbond, Poly-urethane foam, concrete, asbestos, cement/terracotta tiles and tin. Premium Instant Set is a fluid applied product for protecting metal surfaces from corrosion and rust. The cured Premium Instant Set protective coating has excellent dielectric strength, gas permeability, resistance to corrosion creep back, and blistering. ASTM International is one of the largest standards development organizations in the world-a trusted source for technical standards for materials, products, systems, and services. Known for their high technical quality and market relevancy, ASTM International standards have an important role in the information infrastructure that guides design, manufacturing and trade in the global economy. Standards Australia is the nexus for Australian industry. It is internationally renowned for its role in the development of standards and is recognized by the Government as the peak, non-government standards body in Australia. Standards Australia is dedicated to setting benchmarks to meet the growing expectations of the Australian community, industry and government. It remains committed to enhancing the social, environmental and economic well-being of all Australians. UL is the trusted source across the globe for product compliance. Benefiting a range of customers - from manufacturers and retailers to consumers and regulating bodies - we’ve tested products for public safety for more than a century. 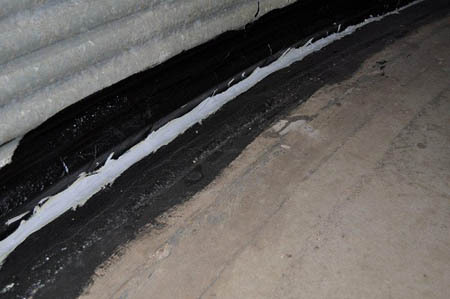 ERA 75A Classification of Liquid Rubber for waste disposal Classified as general waste as a solid inert polymeric material. Class 2 for waste disposal for Non- Putrescible waste. 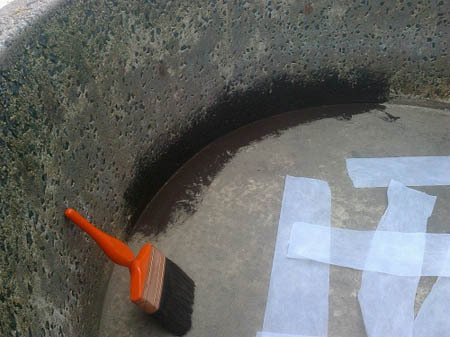 Concrete Water Trough, Liquid Rubber Waterproofing - Step by Step process of painting on the Liquid Rubber using paint brush. Grain Silo Rust prevention around the base of the silo inside and outside treatment. 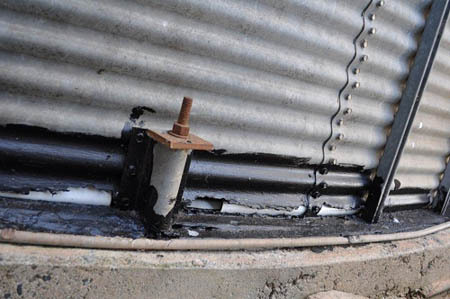 Shut's down the rust and increases the life span of the silo. The same can be done with the wall sheets on sheds, water tanks, concrete footing's.